When Summer Ends releases in one week and I am so excited for it to be out in the world! Even more exciting? I have author Jessica Pennington on the blog today! 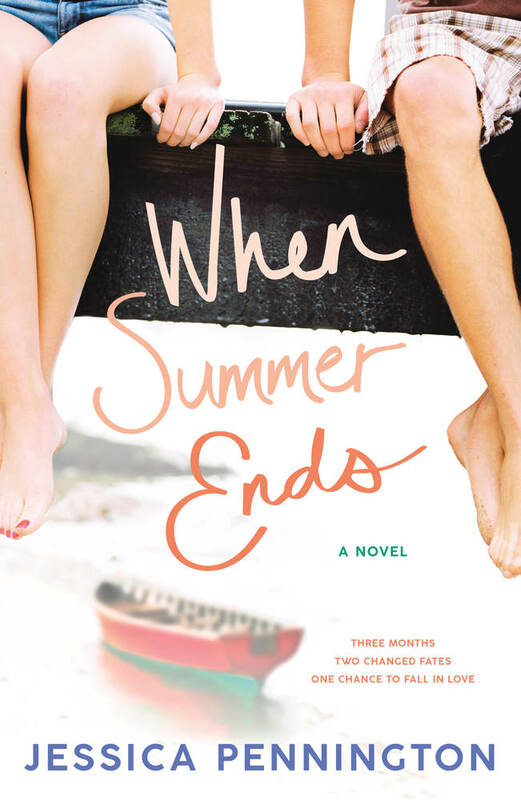 And, in case you missed it, you can read my 5-star review here and find out why you need to add When Summer Ends to your summer reading TBR! Olivia decides to let chance guide her summer plans. Have you ever made a decision based off of a coin flip? No, but I wish I had! That’s sort of where Olivia’s inspiration came from. I like to write girls who take themselves (and life) a little too seriously, because that was always me as a teen. I love writing girls who are somehow forced out of their comfort zones and have to let go of control a little. Probably because I needed to see that as a teen—that everything can go wrong, and your whole idea of the perfect summer or future can be turned upside down, and things are still not going to be as bad as you imagine them, and there’s so much good to be found in those unexpected moments of chaos. In When Summer Ends, Aiden is losing his vision. What kind of research was required to accurately depict this? Aiden’s vision loss is actually 100% based on my own experience being diagnosed with a degenerative eye disease in high school. I wasn’t a star pitcher, unfortunately—I was a very mediocre pitcher—but otherwise, everything Aiden experiences with his vision was personal experience. I also spoke with my doctors and other people with the same diagnosis, just to make sure my experience could be considered ‘normal,’ for my condition. Aiden helps push Olivia outside of her comfort zone through canoeing, sand dune hiking, and visiting an art festival. What are your favorite summertime activities? I love anything on the water—I live in a beach town very similar to the one in When Summer Ends, so I definitely enjoy spending time at the beach. And back before I had a toddler I loved to canoe and kayak, but that happens much less frequently these days. Michigan is beautiful in the summer (I have to remember that during these gloomy winter months!) so outdoor activities are definitely my favorite. How did the writing process for your sophomore novel change compared to your debut, Love Songs & Other Lies? I’ve always heard the talk about how hard it is to write a second novel, and I must have been subconsciously skeptical, because boy was I surprised by how difficult it was! The whole process for me was different, because it was not only my first novel on deadline, it was also my first time drafting since becoming a mom. Love Songs & Other Lies was written almost entirely between the hours of 10pm and 3am, which has always been a creative time for me (thank you, self employment, for the ability to sleep in) but that just wasn’t an option with this book. In a lot of ways I felt like I was re-learning everything! What are your go-to recommendations for fun, swoony YA books set during the summer? Two of my favorites are The Impossibility of Us by Katy Upperman, and My Life Next Door by Huntley Fitzpatrick (I’m pretty sure this is set during the summer—if not, you should read it anyway). You’ve been hard at work on your third novel, Meet Me at Midnight. Is there anything you can share with us about it? Yes, I have! It’s such a fun book, I’ve had a blast writing it. It’s an enemies-to-lovers rom-com (think The Hating Game meets The Summer I Turned Pretty) about two teens who are forced to vacation together each summer in neighboring lake houses. On paper they have everything in common, but in reality, they spend their summers pranking and tormenting one another. It’s full of pranks, fragile alliances, summertime vibes, snarky banter, and more swoony kissing scenes than any book I’ve written so far, I think! You can add it on Goodreads now, and it’s out in April 2020. Sounds like a perfect read this summer…and no, I’ve never been daring enough to live by a coin flip in any capacity, but hey…it COULD be fun! Thanks for sharing! This seems like the perfect summer/beach read so I can’t wait to get my hands on it! I have this on my TBR and will definitely read it during the summer time. Thanks so much for sharing! Thank you for letting me be a part of the tour! Loved this book so much!